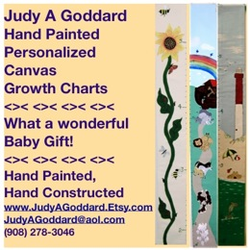 Judy A Goddard, Artisan: National Attention Paid to my Canvas Growth Charts! National Attention Paid to my Canvas Growth Charts! It's an e-newletter that is sent out to subscribers who have children, listing all the fun, cool stuff that will be going on the Seatle area for the coming week. All the listings point to children and family oriented activities. It's a super resource and has a large subscriber list. If you go to North Shore Macaroni Kids you'll see the interview as well as an advertisement that I designed. The neat thing about Macaroni Kids is that there are websites all over the country offering the same wonderful local information. You can visit their "about us" and see if you think that becoming a host is something you might enjoy. And here's the advertisement I made. It's so neat when someone from so far away takes the time to say wonderful things about my work! PS: I know my links are disabled. I am in the process of trying to fix it now.